Tony Juiliani left a Framingham distribution center at 2:21 a.m., after picking up newspapers for his route. WELLESLEY — With his right hand, Tony Juliani grabs a newspaper from a stack in the passenger seat and, with a fluid motion, folds it and stuffs it into a bag he’s holding in his left. He slows his beat-up minivan in front of an elegant white Colonial with a Lexus in the driveway. 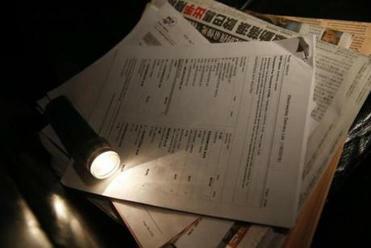 He peers at the list affixed to his windshield, then shines a flashlight at the number on the door. Satisfied, he flings the newspaper out the window into the dark 20-degree chill, and hits the sweet spot by the doorstep. A flashlight illuminated Tony Juliani’s delivery list at 3:17 a.m.
Juliani, who is 75 and has been delivering papers since 1984, is the picture of the perfect delivery man, the stalwart that thousands of subscribers were suddenly crying out for when their Globes stopped arriving last week. He knows the routes, he knows the streets, and he puts the paper right where it should be, with an efficiency that seems downright mechanical. But Juliani is not a machine. And his life evokes how hard it is to make a living as the perfect delivery man. The job, once the bastion of neighborhood kids looking to make a few extra bucks on their bikes, has evolved into a grueling nocturnal marathon for low-income workers who toil almost invisibly on the edge of the economy. Like many other newspaper delivery drivers, Juliani works 365 days a year and gets no vacation, overtime pay, or workers’ compensation. He said he has not taken a day off in six years. He delivers papers from 2 to 7 a.m., heads to a second job some days slinging weekly papers, and then a third dropping off Amazon packages until 8 p.m.
We’ve stumbled, but now it’s time to learn from our failure and make it right. 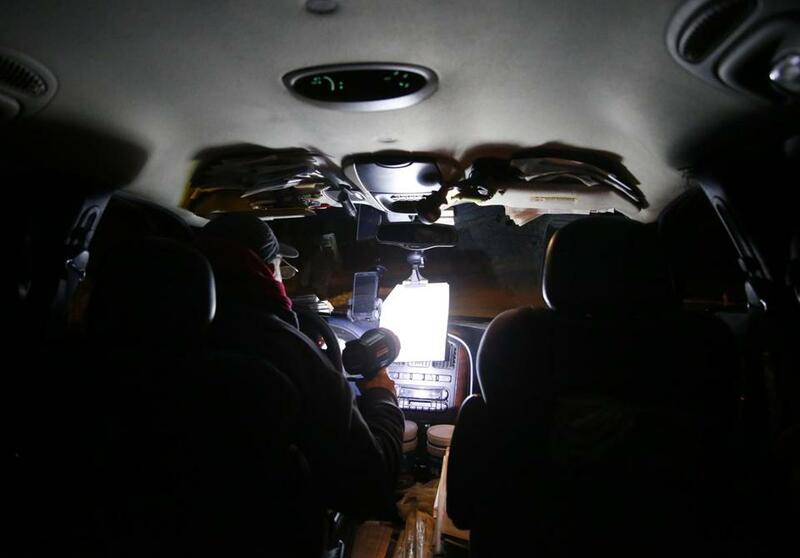 As Juliani worked his route in Wellesley on Thursday morning before sunrise, Danny Jimenez was delivering Globes about 10 miles away on a dark street in Medfield. His wife, Carey, who is 34 weeks pregnant, sat next to him entering addresses in the GPS, and their children, Sophia, 3, and Alijah, 11 months, slept in car seats in the back. When Sophia wakes up, he said, she will help him throw papers out the window. “It’s cute,” he said. Jimenez, 21, is among the temporary drivers hired to help alleviate the Globe’s delivery crisis. He said he is glad to be earning $15 an hour and $30 a day for gas. But he said he does not plan to deliver papers for a living. Next month, he said, he is going to New York to help a cousin install home security systems. 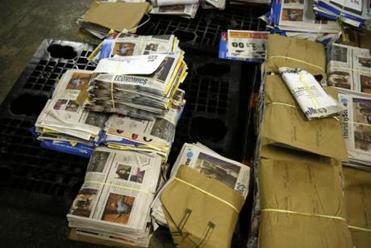 Because most newspaper delivery drivers are classified as independent contractors and not as employees of the delivery companies they work for, they are not guaranteed health insurance or a minimum wage, said Harold L. Lichten, a Boston lawyer. In 2008, Lichten filed a federal lawsuit on behalf of drivers for the Globe’s main delivery company, Publishers Circulation Fulfillment, arguing that the drivers should be classified as employees and paid at least the minimum wage. The company, known as PCF, fought the lawsuit, but agreed to a $1.4 million settlement in 2009 that eliminated some of the practices the drivers had long complained of. PCF said it would stop docking the drivers’ pay when subscribers reported missing or wet papers, and it would no longer reserve the right to fire them for legitimate absences due to illness or injury. PCF also agreed to give the workers a number of sick days per year, and insurance to cover lost income or medical expenses from an injury. Still, the drivers said that as independent contractors, they have no power to negotiate pay and must find a replacement driver if they want to take a day off. Otherwise, they said, they could be fired. 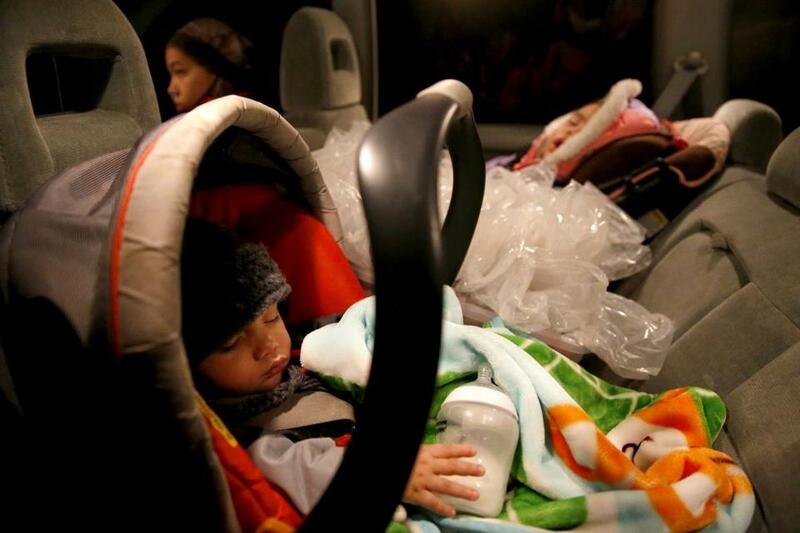 Alijah Jimenez (left), 11 months, and Sophia, 3, slept between a stack of newspapers as their father, Danny, delivered papers in Medfield. A PCF representative declined comment. ACI Media Group, which the Globe recently hired to replace PCF throughout Greater Boston, did not respond to requests for comment. Last week, the Globe announced that it had rehired PCF to deliver papers along with ACI. Many drivers in the region are immigrants from Brazil, Haiti, and Central America who work second and third jobs in construction, food services, and cleaning. Several were fearful of having their names printed in the Globe, saying they could lose their delivery routes. 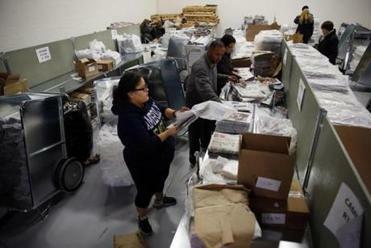 One driver, a father of four from Guatemala, has been delivering the Globe, Boston Herald, New York Times, and Wall Street Journal for the last nine years for PCF. He said he bags the newspapers at a warehouse at 2 a.m., drives a three-hour route , and is paid $300 to $400 a week. Then he works as a maintenance man at a building in Brighton. Since PCF does not give him any vacation days, he said that he paid a friend $500 to cover his route when he visited family in Guatemala for two weeks last year. Otherwise, he said, he has not missed a delivery in years. Globes sat in a stack at the Framingham distribution center. The Globe, seeking better service as well as millions of dollars in savings, made the switch from PCF to ACI on Dec. 28. PCF drivers like Juliani continued to deliver the Times, Herald, and other papers. But ACI did not have enough drivers to handle the Globe and was using faulty routing software, sparking an uproar when tens of thousands of papers went undelivered. Last Sunday, scores of Globe reporters, editors, and other staffers helped deliver the papers themselves. Alexander Exposito, a 39-year-old father of two from Hyde Park who has been delivering papers in Roxbury for 14 years, said he was taken aback to see Globe staffers doing his job that morning. For them, it was a one-day rescue mission; for him it is a job. Some subscribers have asked why paper boys and girls could not cover the routes, as they did decades ago. But in an era of fewer home subscribers, delivery personnel must cover much more ground — sometimes 60 miles a day — making a bicycle route impractical. Some readers have also expressed concern that, by changing delivery companies, the Globe appeared to be seeking savings by squeezing low-paid drivers. But Scott Mains, who runs ACI’s Framingham distribution center, said ACI has been giving drivers a $2,500 signing bonus. 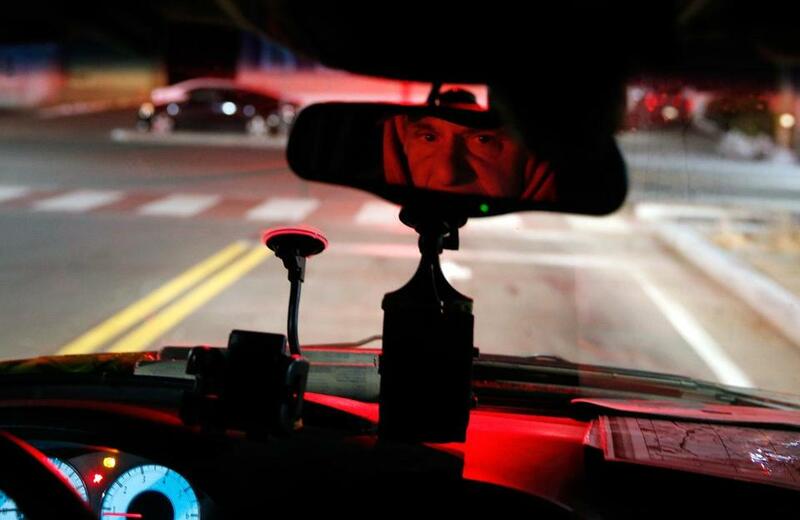 Temporary drivers, like Jimenez, are paid $15 an hour, while the contract drivers said they are given a per-paper rate that fluctuates depending on the distance they have to drive. Several drivers said ACI was offering them a few pennies more per paper than PCF, but was also giving them longer, more arduous routes. Some figured the small bump in pay wasn’t worth the added gas costs and longer hours. Patricia Soisson, who has delivered papers for 22 years, said she turned down an offer from ACI and quit PCF in disgust after the delivery fiasco. She said she has heard from Globe subscribers who have not gotten papers since ACI took over her route in Wellesley. Juiliani, trying to find a location on his route, sat in his vehicle at 4:57 a.m. on a recent morning. Michael Levenson can be reached at michael.levenson@globe.com. Follow him on Twitter @mlevenson.